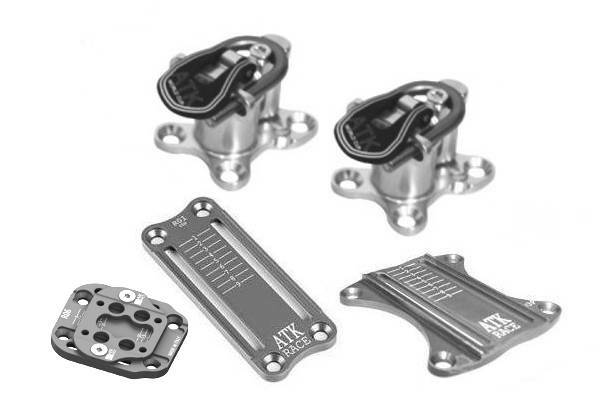 ATK make an excellent rear unit, light, strong and with absolutly no lateral move before release. The frontal release non adjustable is about 9 (with no warranty because not certified DIN / ISO) but optional we can modify it about 7.5 or put a fork 'lady' about 6. The latéral release non adjustable is about 9 (with no warranty because not certified DIN / ISO) but optional we can modify the spring to obtain about 8, 7 or 6. Weight : 86 g/pair (0.19 lb) without screws (146 g with plate narrow, 156 g with plate wide, 169 g with plate TLT). Warning: Without plate (length not adjustable), we need a ski boot for mounting the rear unit , otherwise we only mount the front unit.